Phishing Scam Messages on Skype, what you have to do. 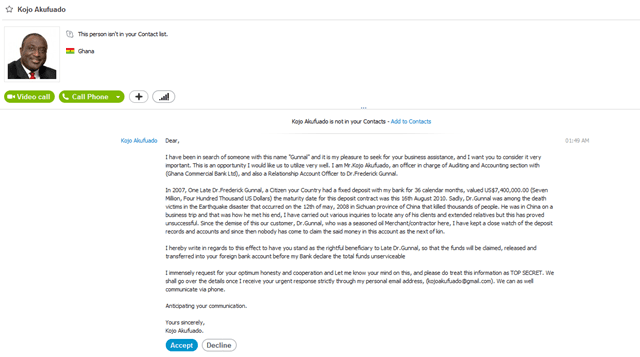 I received today below scam message on my Skype. A quick google search finds a handful of complaints about these scam messages. 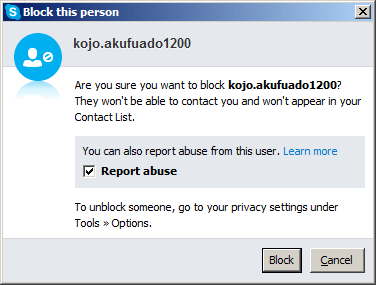 Whenever, you end up similar scam, spam and phishing messages, ensure you block that contact and report it as abuse. I have been in search of someone with this name “Gunnal” and it is my pleasure to seek for your business assistance, and I want you to consider it very important. This is an opportunity I would like us to utilize very well. I am Mr.Kojo Akufuado, an officer in charge of Auditing and Accounting section with (Ghana Commercial Bank Ltd), and also a Relationship Account Officer to Dr.Frederick Gunnal. In 2007, One Late Dr.Frederick Gunnal, a Citizen your Country had a fixed deposit with my bank for 36 calendar months, valued US$7,400,000.00 (Seven Million, Four Hundred Thousand US Dollars) the maturity date for this deposit contract was this 16th August 2010. Sadly, Dr.Gunnal was among the death victims in the Earthquake disaster that occurred on the 12th of may, 2008 in Sichuan province of China that killed thousands of people. He was in China on a business trip and that was how he met his end, I have carried out various inquiries to locate any of his clients and extended relatives but this has proved unsuccessful. Since the demise of this our customer, Dr.Gunnal, who was a seasoned oil Merchant/contractor here, I have kept a close watch of the deposit records and accounts and since then nobody has come to claim the said money in this account as the next of kin. I immensely request for your optimum honesty and cooperation and Let me know your mind on this, and please do treat this information as TOP SECRET. 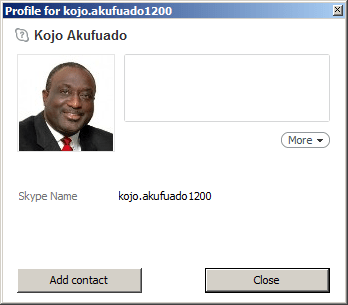 We shall go over the details once I receive your urgent response strictly through my personal email address, (kojoakufuado@gmail.com). We can as well communicate via phone.